For those of you who haven’t already got your tickets – hurry! 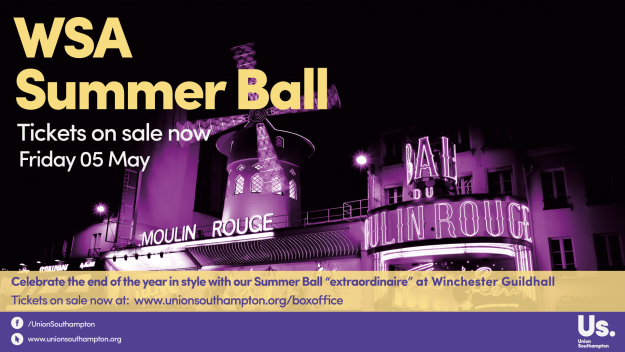 You only have three more days to sort your plans for the night of the year at Winchester Guildhall on Friday night. You can expect unforgettable performances from an aerial artist, electro-swing DJ, Jamie Berry and music from our very own Surge Radio, plus ticket holders will get a voucher code emailed through to them to enjoy Domino’s deals across the weekend. The evening will begin at 20:30, where the first 50 guests will be greeted with a free glass of prosecco, as well as plenty of opportunities to enjoy mouth-watering fruit cocktails and mocktails for just £4 each or 2 for £7, as well as £1 sourz shots. We will have a photographer on hand to capture all your memories, complete with a Moulin Rouge-themed backdrop of the famous windmill, plus many more decorations to make the night glitter, as well as chance to hit the photo booth.